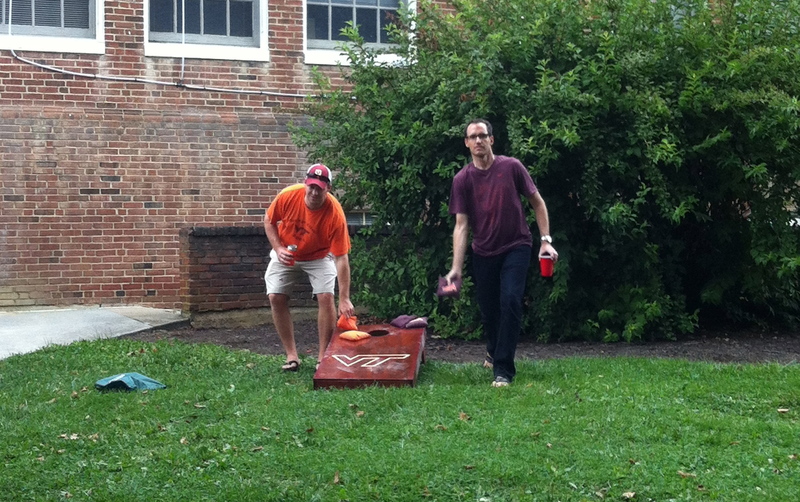 As it turned out, we were able to sneak in a Virginia Tech game when we were in the States. Gabe joined me in Virginia, so that we could drive up to Ohio together to help with the wedding preparations and to see Gabe’s friends & family. And, do you know what falls on the way driving between Virginia and Ohio? Blacksburg!! It was amazing timing that the same day we planned to drive happened to be the Monday night home season opener. What luck! Or, maybe it was fate! For those of you know don’t know about American football, we can be quite fanatical about it. 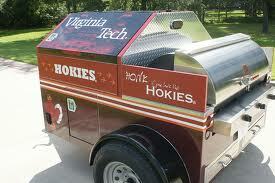 My university, Virginia Tech, located in Blacksburg, Virginia, is no exception. I am less fanatical than most of my friends. I only wish I could be as dedicated as them, but a three-year long distance relationship and International move has inhibited by game-attendance. Beyond the “Enter Sandman” and the actual game watching, most of the fun around game attendance is doing something called “tailgating”. I will explain it for those of you who aren’t from America. Before the game, people park their SUVs (sport utility vehicles) in the parking lots surrounding the stadium. They arrive much earlier than the start time, sometimes 12 hours in advance. 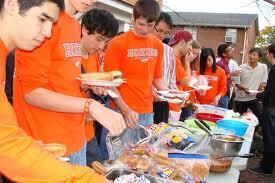 They set up food and drinks on the tailgate of the car. 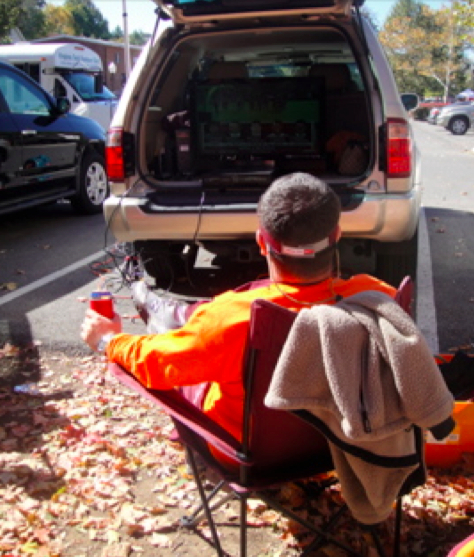 More committed tailgates also have chairs and tables that they set up behind the car. And they “pre-game” for many hours before the actual game is set to occur. -delicious foods such as : fried chicken, deviled eggs, pasta salad, ham biscuits, chips, and homemade desserts. Sometimes there are hot dogs and hamburgers. In the winter, there can be soups and chilis to keep you warm. Two of our couple friends, both of which have given birth to their first child in the last 9 months, rent out an apartment for the season. 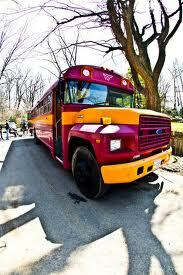 This enables them to have an entire weekend dedicated to Hokie football. They bring sofas, TVs, and blow up beds and pay rent. They’ve been doing it for years. And now the babies are here, they haven’t stopped. That’s serious commitment. These same friends may or may not have a generator, special TV and slingbox/cable for their car to tailgate, so you can watch the ESPN commentary live. 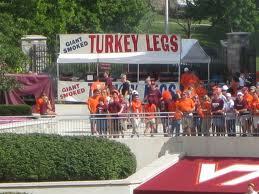 I grew up with a Hokie Fan who has only missed 3 Virginia Tech home games in the last 25 years. 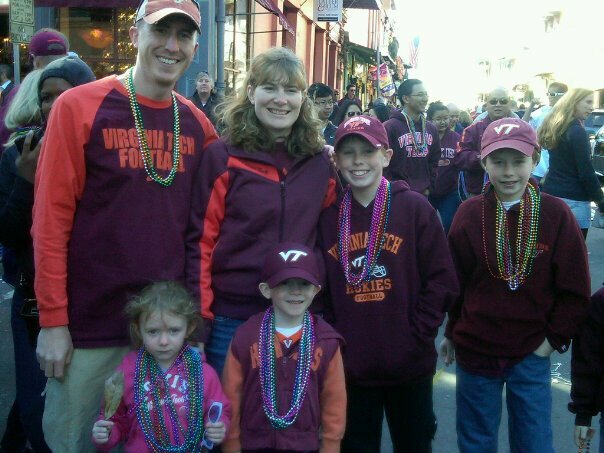 The Hokie-tastic family where the dad, my friend, has missed 3 games in 25 years! 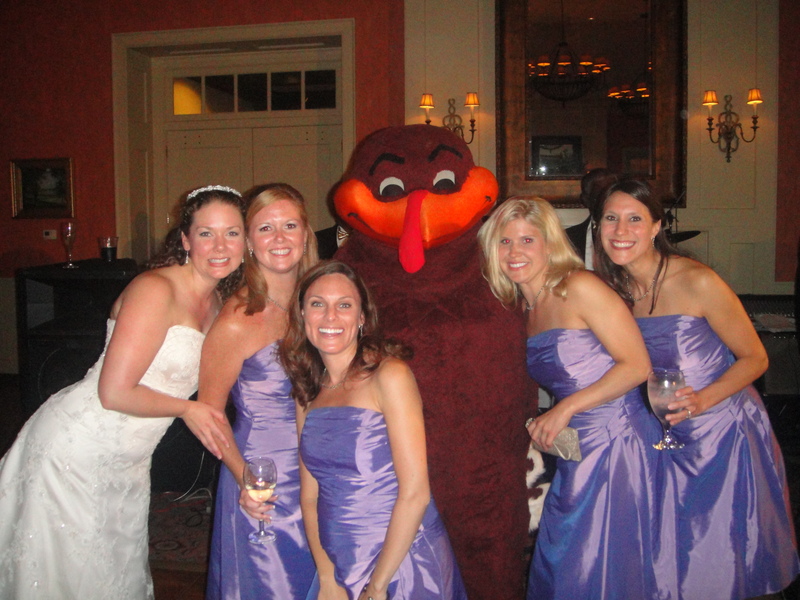 I was in a wedding of one of my best friends that was completely VT themed. 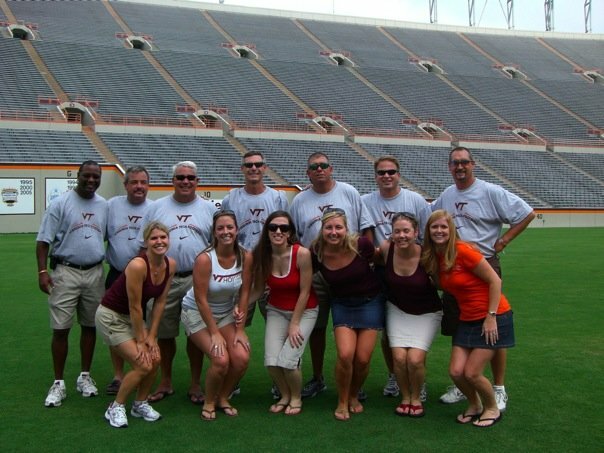 A bunch of us gals are so serious about VT football that we actually went to Women’s training camp in Blacksburg to prepare for the upcoming Football season. This is Gabe’s third VT game. 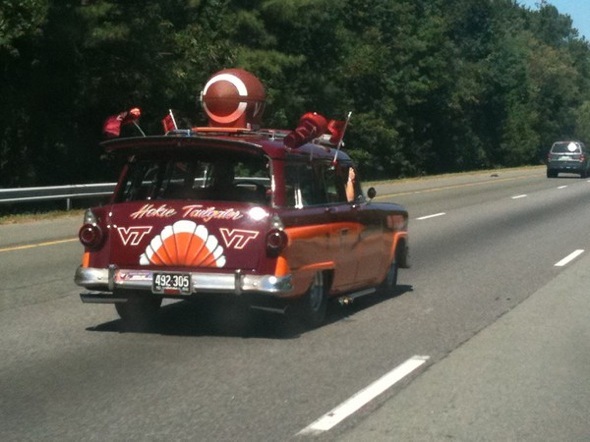 He is very good at cheering for VT, as long as they aren’t playing against Ohio State or Miami of Ohio (his alma mater). He also doesn’t like eating the turkey legs they serve there as he considers in cannibalistic. 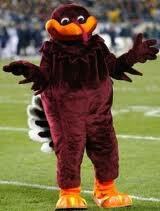 Which it is, sort of, since our mascot is a turkey. You should see the opposing team’s jeers and posters on Thanksgiving game weekend! Anyhow, this game, we bought Gabe his first VT shirt. 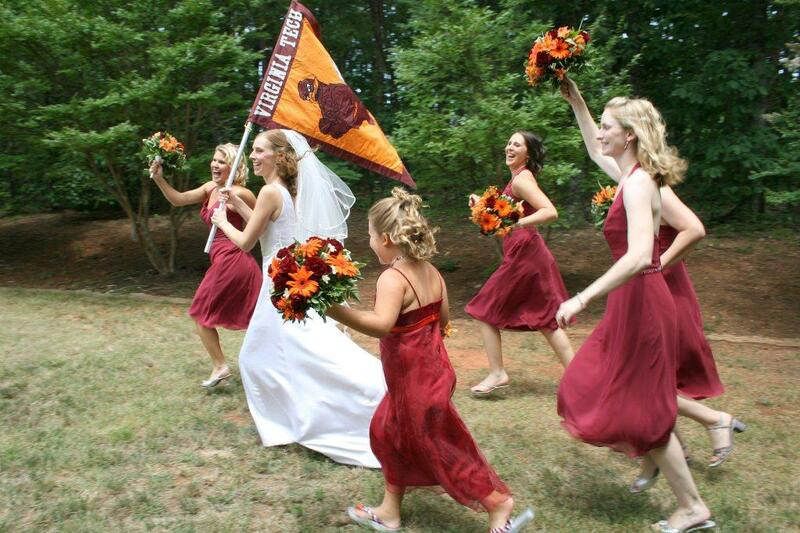 I think marriage has finally convinced him that he probably needs one since I’ll be trying to get him to go to more VT games in his lifetime than he’d previously planned on. 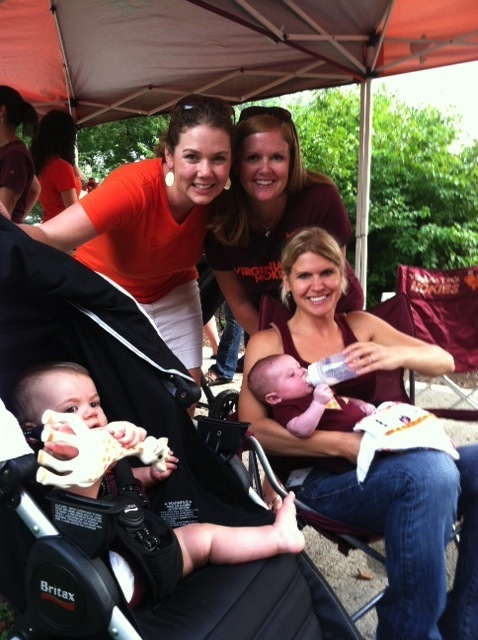 The game was great – we got to tailgate and sit with great friends. 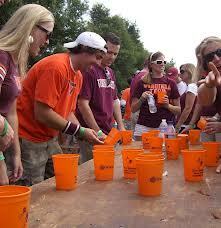 VT finally pulled out a victory in overtime, the first in Lane Stadium. 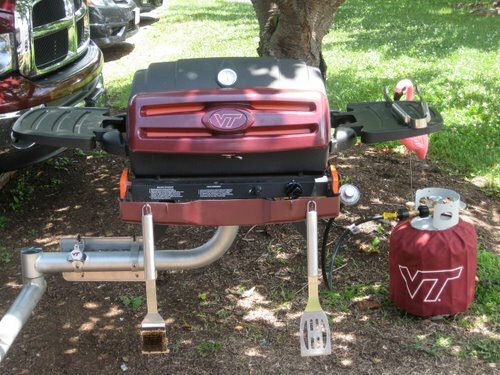 Go Hokies! This entry was posted in Travel: USA. Bookmark the permalink.